'Supersnoop' Sweet Pea is a dwarf bushy variety with bright coloured beautiful fragrant flowers. Early booming and heat resistant, they grow to only 45 to 60cm (18 to 24in) tall. This excellent sturdy spreading variety needs little or no support. It wends its way through the garden or over the edge a planter just beautifully. Great for containers or a front planting in the flower-bed, it has no tendrils. Use for carpeting a border or for trailing over the edges of containers, hanging baskets & window boxes. Germination of sweet pea seed is often quicker and more uniform if the seeds are soaked in water for 24 hours prior to sowing. This also enables you to identify any seeds with hard coats, which fail to swell during this period. These should have the seedcoat nicked with a small file to enable them to take up water. A temperature of 18 to 20°C will give rapid, even germination. As soon as the seedlings have emerged, they need to be grown as cool, and with as much light, as possible. If you have a reliable source of John Innes seed compost, or for spring sowing John Innes No 1 potting compost, these will be eminently satisfactory for sweet peas. J.I. Nos 2 & 3 are too strong for seed sowing and should be avoided. We use a good quality peat based seed compost which has given consistently good results. Sow in Autumn to Early Winter into rootrainers or long thin pots. Push two well spaced seeds about 2.5cm below the compost surface. When roots fill rootrainers, pot on two seedlings into a two litre pot. Pinch out the tips when plants have 3 or 4 pairs of leaves. Over-winter undercover in a light, cool place. 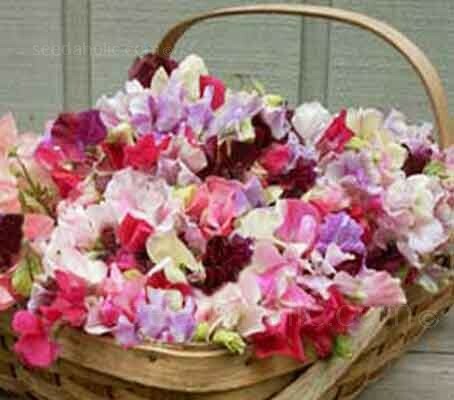 Sweet peas can also be sown direct into the open ground where they are to flower. The best time for this in the UK is mid March to early April, depending on the weather and the locality. Sow 2 to 3in apart, about 1 to 2in deep and thin the resulting plants to an average of 6 to 8in apart. Slugs and mice can be a real problem on a direct sown crop, so take suitable precautions before you sow. Watering: Young seedlings can be prone to disease if over watered, but once the crop is in full growth, a copious supply of water is needed. A well prepared site will pay dividends by having considerable reserves of available moisture. It is essential to encourage a strong root system if high quality flowers are to be achieved. Lathyrus comes from the ancient Greek name for the pea, and 'odorata' refers, of course, to the lovely scent of the original plant, as well as some of the newer hybrids (many hybrids sacrificed the fragrance for larger flowers in new colours, but happily breeders are working to reverse this trend). The original vineing plant of Lathyrus odorata came from Italy, and reached the English shore in 1699. If you are interested in the growing of sweet peas, why not join “The Eckford Sweet Pea Society of Wem” Named after Henry Eckford of Wem who began work on the flower in about 1876. it is dedicated to the conservation and promotion of these varieties. For details, send an s.a.e. to the Membership Secretary, Lyndale Nook Farm, Weston-under-Redcastle, Nr. Shrewsbury, Shropshire, SY4 5LP.